Every year a part of Huntersville, North Carolina (just outside Charlotte) is transformed into a 16th Century European Country Faire when the Carolina Renaissance Festival opens to the public during the months of October and November. The Carolina Renaissance Festival is a mixture of an amusement park, shows, comedy, music, feats of daring, street performers, shopping, and indulging. The festival is spread out over 30 acres, and it is easy to spend an entire day there. Costumed characters, staged presentations, village artisans with craft demonstrations and living history troops, such as The Queen's Court, bring the 16th Century to life. Nine stages are scheduled with music, dance and comedy acts every half hour. Craft demonstrations are on-going throughout the day. 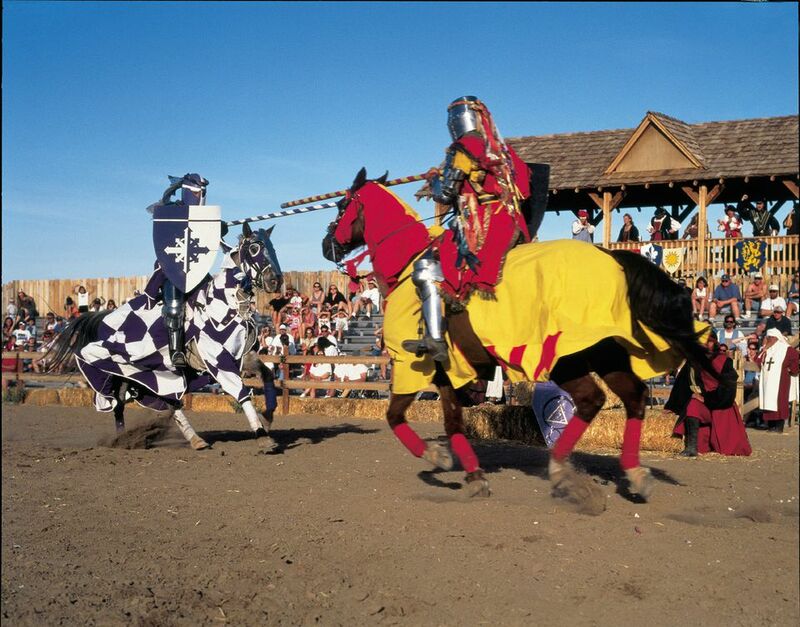 A major festival feature is the re-creation of jousting tournaments with knights in armor performing on horseback in the King's Tournament Arena. Hours: 10 a.m. to 5:30 p.m. each Saturday and Sunday, rain or shine. Admission prices vary depending on what weekend you visit, when you purchase your tickets, and even the method by which you purchase them. Discount tickets are available, as are season passes so you can attend every single day of the festival. There will also be three student days during the week, where students can get discounted tickets. For more information, including info on how to get discounted tickets, visit our Carolina Renaissance Ticket Information Page. If you're looking to visit the Renaissance Festival, you're going to need to know how to get there! Since it's a "one time a year" event, you may not remember even if you've been before. No worries though, because we've got everything you'll need to find your way there with our Carolina Renaissance Festival Address, Directions and Parking Page. The festival will have several special weekends, including a BrewFest Weekend, special Halloween events, Pirates' Christmas, Celtic Trader Jams Weekend and the Final Huzzah! For more the dates and more information on each of these weekends, visit our Carolina Renaissance Festival special weekends page. A favorite part of many visitors to the Carolina Renaissance Festival is the costuming. Of course, you don't have to dress the part to visit and enjoy the festival, and many people don't. But for those that do, walking the grounds in period garb only adds to your experience. Here's where to rent or buy a costume, and even how to make your own (and send us your best photo!). From music to sports to arts to culture, there are always plenty of festivals happening around town. Click here for a month by month calendar of festivals in Charlotte. Know of a festival we don't have listed? Let me know at charlotte@aboutguide.com.